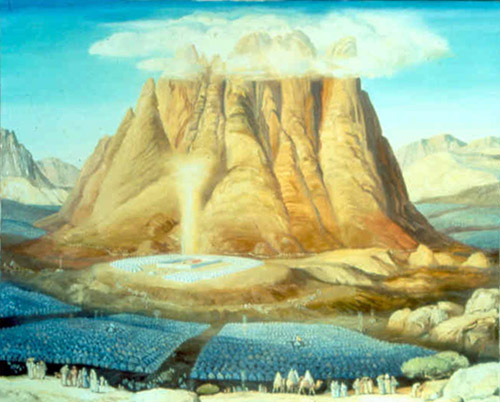 The Connection of the Haftorah to the Parsha: Parshat Vayakhel deals with the construction of the Mishkan and the Haftorah, with the construction of the Beit HaMikdash. A photo from the Mosque atop Har Habayit where the Even Shesiya or Creation Stone rests. The storyline of this week’s Haftorah according to the Sephardim: King Solomon spent 7 years building the Beit HaMikdash. Now King Solomon is ready to furnish the temple with its utensils. Shlomo engages Chiram from Tyre whose mother was a widow and his father a master coppersmith from the tribe of Naftali, to produce all the copper articles that were required in the Beit HaMikdash. Chiram’s father had established continuity by transferring his wisdom over to his son. Both the Mishkan and the Beit HaMikdash, were constructed by the two tribes of Yehudah and Dan: the spiritually strongest and weakest tribes, respectively. This was done deliberately to show ACHDUT, unity, within the Jewish nation. The Haftorah narrates the description of the two pillars in the hall. Chiram casted the two pillars from copper, named Yachin and Boaz. Yachin was on the right and Boaz on the left. 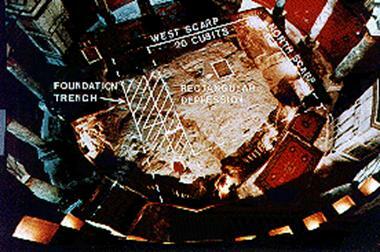 They were 18 cubits (18”-24”) high and 12 cubits in circumference. Atop the Pillars were decorations. The “Crowns” were 5 cubits high and had Lulavim, Rimonim and Shoshanim. Shlomo placed the pillars by the entrance to the Kodesh area. 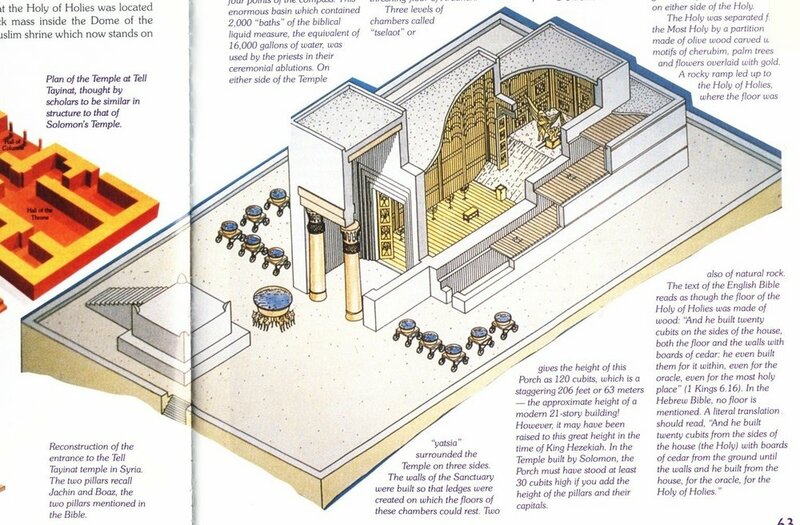 The Sea-Mikveh or water basin was 10 Cubits across with a round top and square bottom. Holding up the basin on each of the 4 sides, were 3 bulls facing outwards. Some say they represented the 12 Mazalot, astrological signs, of the zodiac. It took 16,500 gallons to fill up the Mikveh. The storyline of this week’s Haftorah for the Ashkenazim: Chiram, hired by King Solomon as an artist, formed the Temple treasures from brass and copper. Chiram made small basins for removing the ashes from the altar, the rakes for raking the ashes, and the bowls to sprinkle the blood of the sacrifices on the side of the altar. Chiram completed every task that King Solomon asked him to do in the House of Hashem. Yachin and Boaz, the two giant columns, were at the entranceway of the Temple. There were two columns with two crowns at the top of the columns. As a part of the crown of the columns, two rows of pomegranate designs were placed: 400 in all. The Mikveh was a very large basin with 12 cattle arranged in four rows of three at the base. It was used for the Kohen to immerse himself in before performing the priestly work in the Temple. The utensils were made in the plains of the Jordan, actually to the east of the Jordan in the tribe of Gad’s territory. Chiram had a factory there, casting them in dense clay molds. The location of this factory was between the city of Sukkoth and Zarothan. So many utensils were manufactured, that King Solomon stopped counting them. The weight of the copper was never determined. Solomon made all the utensils that were for the House of Hashem- the Golden Altar and the Shulchan, the Table (that supported the Lechem Hapanim, 12 loaves of Show Bread) were fashioned of gold. The Menorah: There were 5 menorahs on the right side of the temple and 5 on the left side. A total of ten menorahs were in front of the dividing wall of the inner Sanctuary of the Temple. Each of the seven lamps on the menorah was decorated with a flower pattern on it. All the work of King Solomon Temple was now completed. Then King Solomon brought the Holy things of his father King David. There were silver and gold. He put them in the treasury of the Temple. Was crowned as king at the age of 12! Shlomo ruled for 40 years and passed away at the age of 52. As King, he led the building of the Beit HaMikdash, starting at 16 years of age, which lasted for 7 years. He was extremely wealthy; By some estimations his wealth increased by $250 million dollars a year. Shlomo was famous for his stables that housed 40,000 horses and 12,000 horsemen. King Shlomo had 700 wives and 300 concubines. Founded 3 cities: Megiddo, Hazor and Gezer in the north of Israel. Instituted, among others, the two mitzvot of Eiruv and Nitelat Yadayim (the ritual washing of hands) and the third blessing in Birkat Hamazon, Bonei Yerushalayim. The Eiruv is a string surrounding an outer perimeter of an area thus designating it as a permissible place to carry things on Shabbat. Haftorahman’s lesson of the week: Both the Mishkan and the Beit HaMikdash were constructed by the two tribes of Yehudah and Dan, the spiritually strongest and weakest tribes, respectively. This was done deliberately to foster achdut, unity. One of the reasons for the destruction of the second Beit HaMikdash-and the continued exile throughout the millennia- is a lack of unity among Jewish brethren. What are you doing to foster a sense of unity among your peers, your family members, your co-workers and your neighbors? How do you treat those whom you perceive as financially or intellectually inferior to you? Seek to discover what unites us all rather than what divides us. See the Two Pillars Chiram made and King Solomon placed in the entrance to the Kodesh area of the Bait Hamikdash. Also note the Mikveh that had 12 bulls holding it up. When filled it had 16,500 gallons of water in it.